Along with helping people across the country find local martial arts schools, we like to keep track of industry news, cultural trends, and professional events. One thing that recently caught our eye is the new Proflex Striker Series Trinity. In addition to Proflex, this event is also promoted by Thailand-based Full Metal Dojo (FMD) and is held at The Ambassador Bangkok. 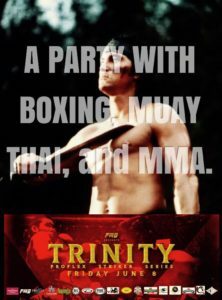 The structure of this fighting event combines Boxing in the first round, Muay Thai in the second round, and MMA in the third. Thus, the name Trinity. The inaugural event was held on May 12th, 2018 and it was obviously a great success as the venue and promoters immediately schedules a second event to be held on June 9th. You can check Full Metal Dojo’s FB page for the latest information. A TV broadcast should also be available through FoxSports Asia. It’s an intriguing idea to entice fighters to challenge themselves and expose themselves to other fighters they might not otherwise face. It’s also an intriguing idea as a bid for crossover appeal both in international audiences as well as different martial arts.